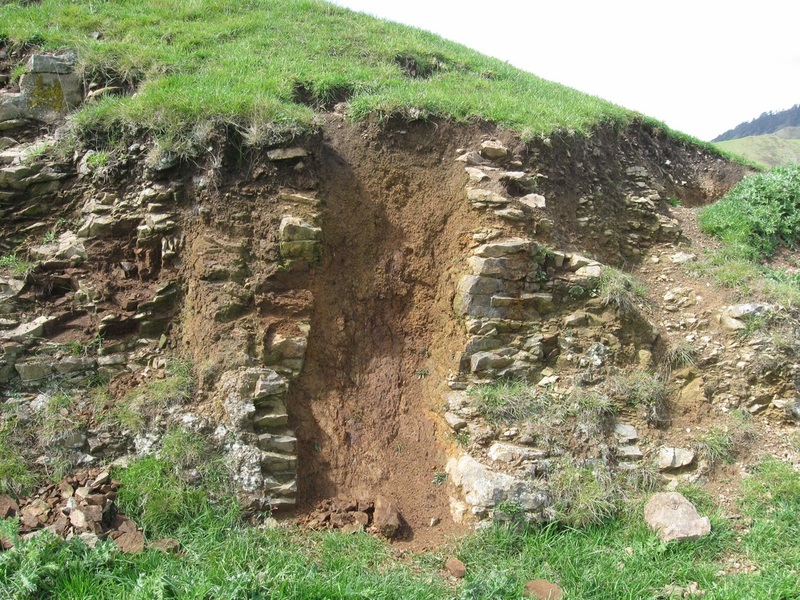 The work described here has been done by members of the Nelson Rock and Mineral Club, as part of a project led by Ian Ladds. The Club is extremely grateful for the access kindly given to the farm by the land owners, Richard Hunt and Hamish Parks. We thank them for their generosity. The study is being done using a variety of methods. 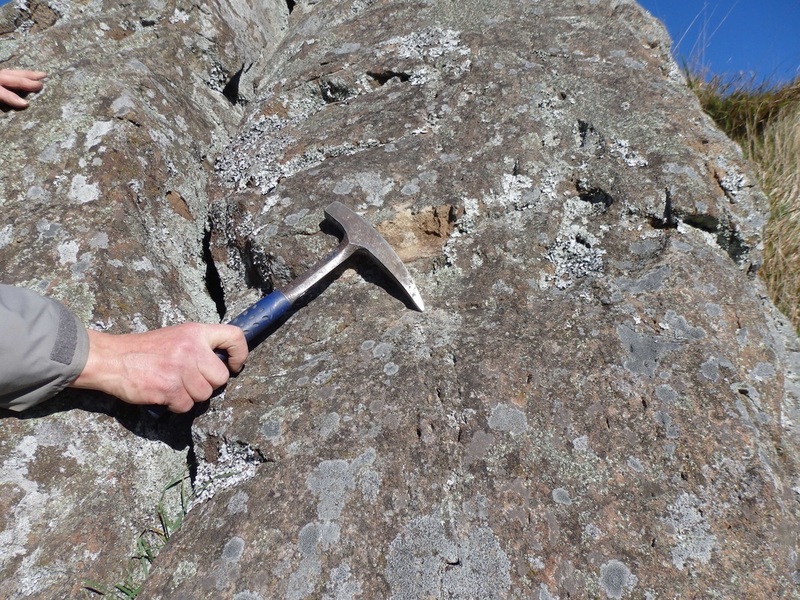 Field work provides the basis for the study, and involves detailed examination of available rock sections, screes and landforms. All sites are geolocated using GPS and recorded in descriptive notes and, where appropriate, with photographs. Fossil finds are classified in the field and, to confirm classification, good, type specimens are photographed and collected. 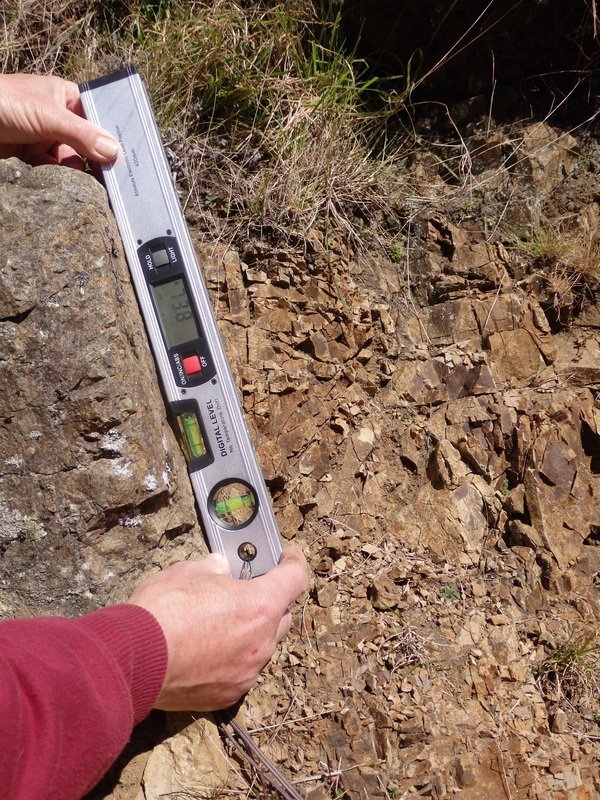 Where in-situ bedding features can be distinguished, measurements of dip and strike are made using an inclinometer and compass. All field records are collated in an Excel spreadsheet and mapping is done using a geographical information system (QGIS). ​The study area (Highfield Farm) lies on the west flank of the Richmond Hills, about 5 km south of Wakefield, near Nelson. The Eighty-Eight Stream runs through the farm, from south to north, and is joined by a series of right-bank tributaries, that have cut deep gullies into the hillside. 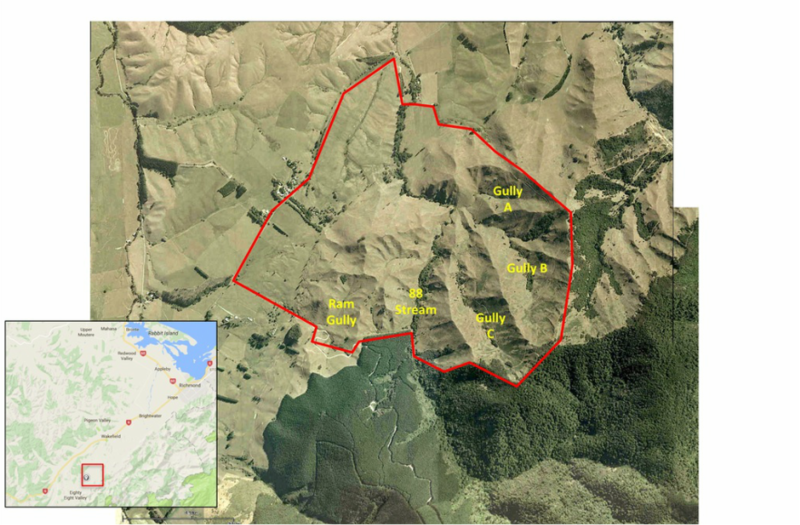 The deep, V-shaped valleys have broadly straight slopes, at an angle of about 15-20o and are covered mainly by rough pasture, with residual areas of native bush. 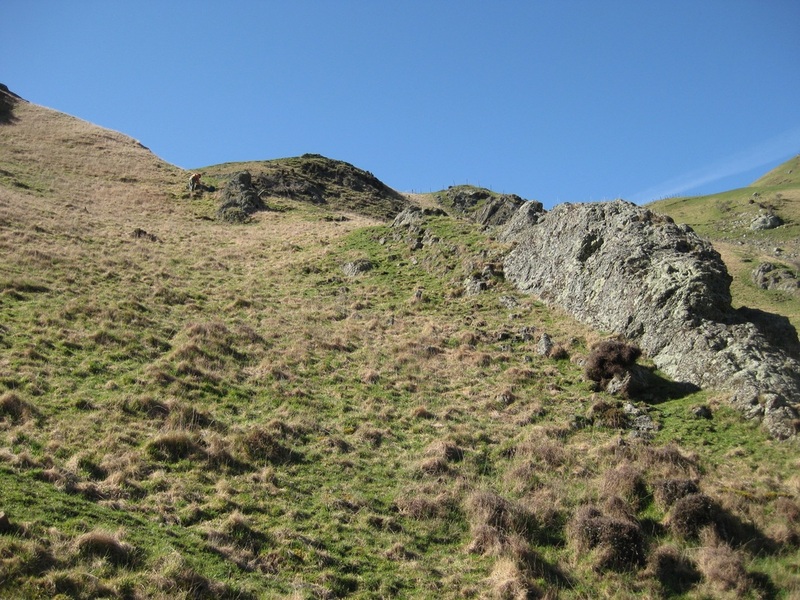 Outcrops are limited, and mainly occur as localised knolls and ridges on the more exposed south- and west-facing flanks. ​Screes and blockfields are common, but are generally limited in area and of shallow depth. Sorting is poor, and it appears that most of the debris has not travelled far downslope. Many of the screes have been supplemented by debris eroded from the access-tracks that have been cut through the farm. These, also, provide small sections in the bedrocks. ​Several previous studies have been made in the Eighty Eight Valley (e.g. 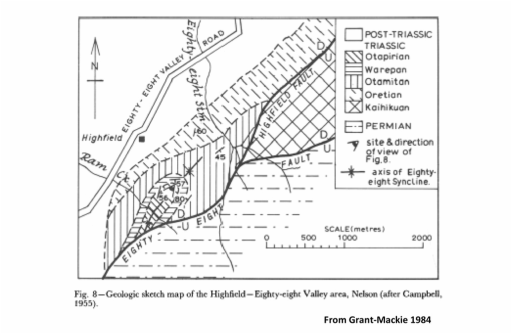 Campbell 1955, 1974; Grant Mackie 1984), which have described and mapped the geology. These show that the area mainly comprises a series of rocks of Triassic age, faulted against older rocks to the south and east. Younger, Tertiary and Quaternary sediments fill the Waimea Valley to the west. Five main stages within the early Triassic have been recognised. From oldest to youngest these are the Kaihikuan, Oretian, Otamitan, Warepan and Otapirian. 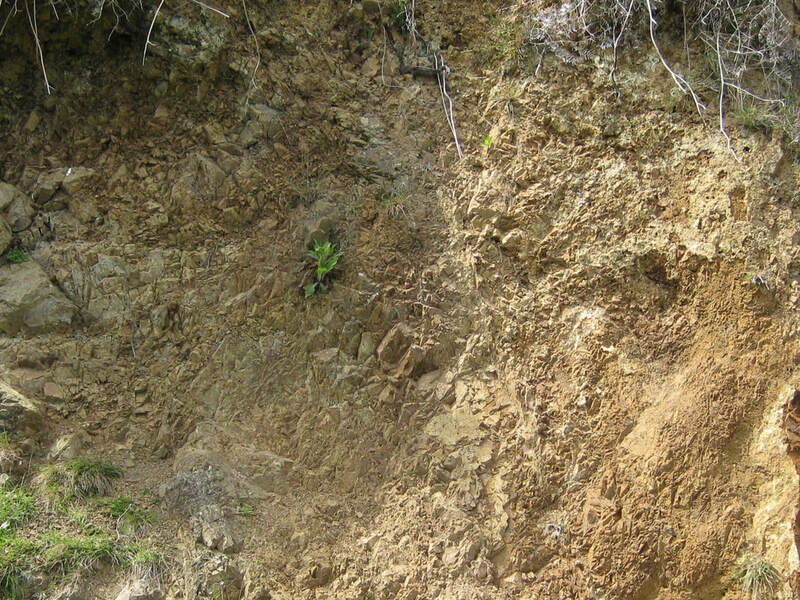 An older Triassic formation, the Etalian, has been mapped elsewhere in the Nelson region, but has not previously been distinguished in the Highfield area. 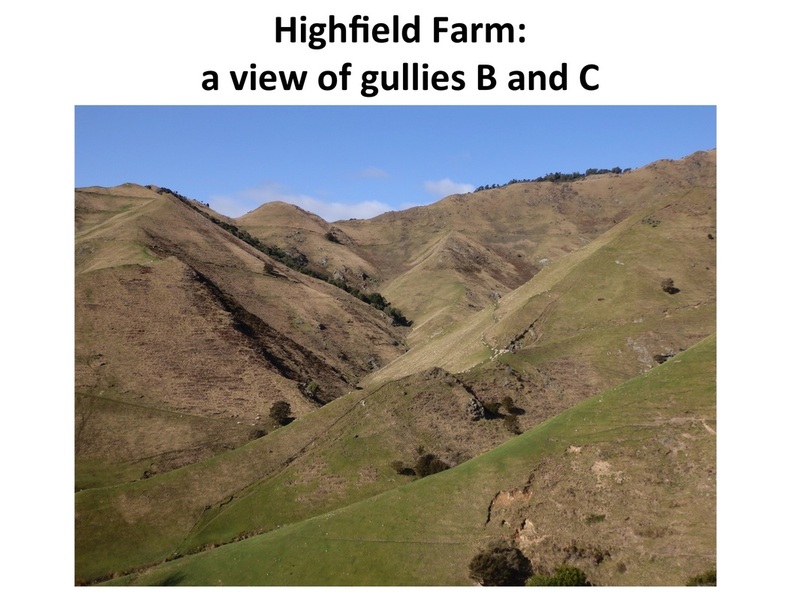 Previous mapping at Highfield, as in the image shown here from work by Campbell, has been generalised and less detailed than we are doing in our study. Campbell, J.D. 1955 The Oretian stage of the New Zealand Triassic System. Transactions of the Royal Society of New Zealand 82 (5), 1033-1047. Campbell, J.D. 1974 Biostratigraphy and structure of Richmond Group rocks in the Wairoa River-Mount Heslington area, Nelson. 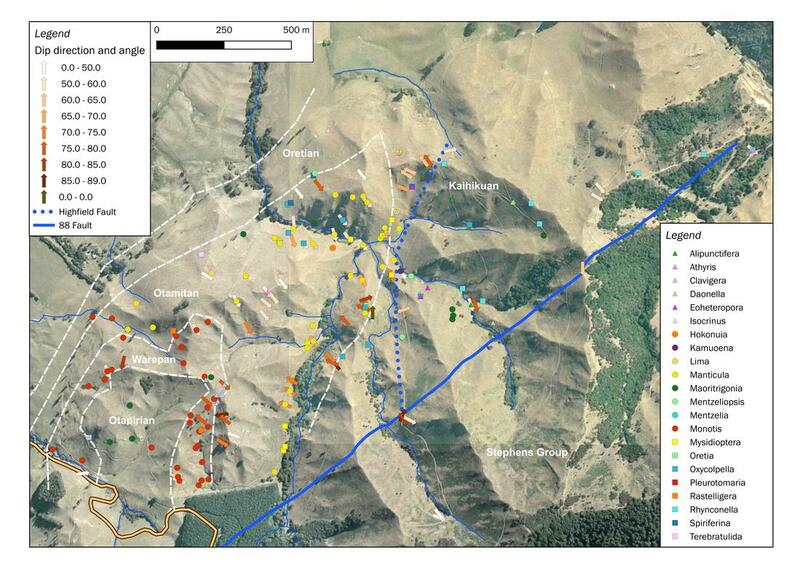 New Zealand Journal of Geology and Geophysics 17 (1), 41-62. Grant-Mackie, J.A. New Zealand Warepan (Upper Triassic) sequences – Murihiku Supergroup of South Island. Journal of the Royal Society of New Zealand 14 (2), 175-206. ​​Most of the Triassic bedrocks at Highfield consist of fine-medium sandstones and siltstones, with smaller quantities of coarse sandstone, gritstone and conglomerate, and layers of mudstone. Some of the rocks are tuffaceous, and within the conglomerates occasional pebbles of granite can be found. 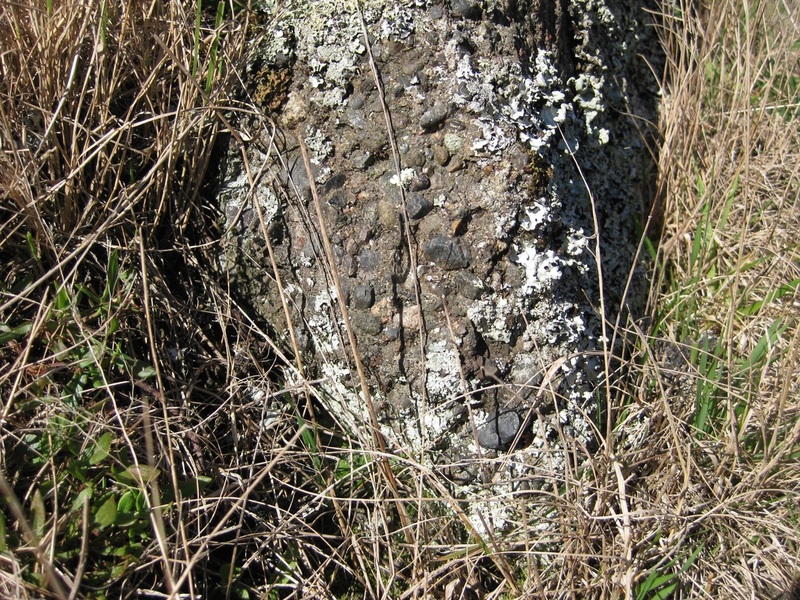 ​The rocks are heavily jointed, and bedding is usually indistinct; bedding structures, such as sole marks, ripples or evidence of graded bedding are scarce. Occasionally,however, variations in rock type can be identified and followed across the landscape. The example below shows a bed of pebbly conglomerate that can be traced along the foot of the outcrop shown in the accompanying image, for several hundred metres. This helps to identify the line of the bedding. Some of the best indications of the bedding are often given by fossils, especially where these occur in clearly defined fossil beds. The photograph on the right below shows a bed of Manticula problematica; the photograph top left shows a bed filled with Monotis sp.. 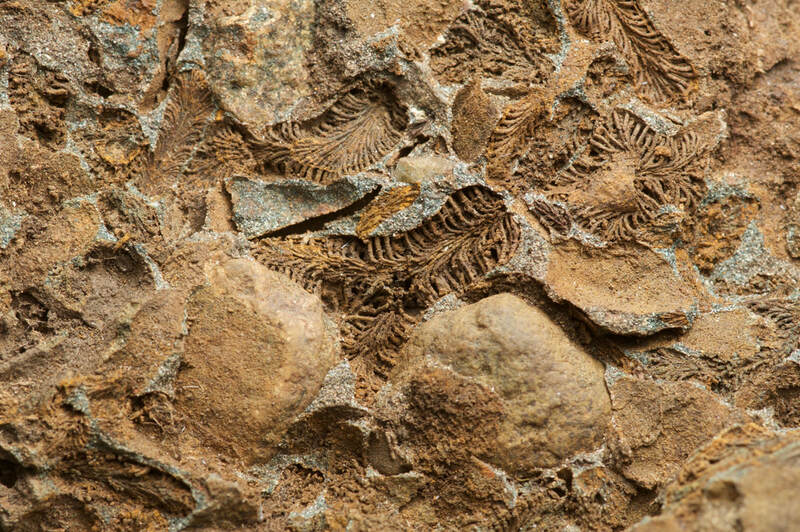 Clues to the bedding can also be found where fossils are more sparsely distributed. In the photograph on the lower left we can detect small crevices in the surface, made by the fossil Manticula problematica. These run in lines from the top to the bottom of the photograph, marking out the bedding planes, which run steeply into the outcrop (away from the viewer). Top left: A bed of Monotis sp.. 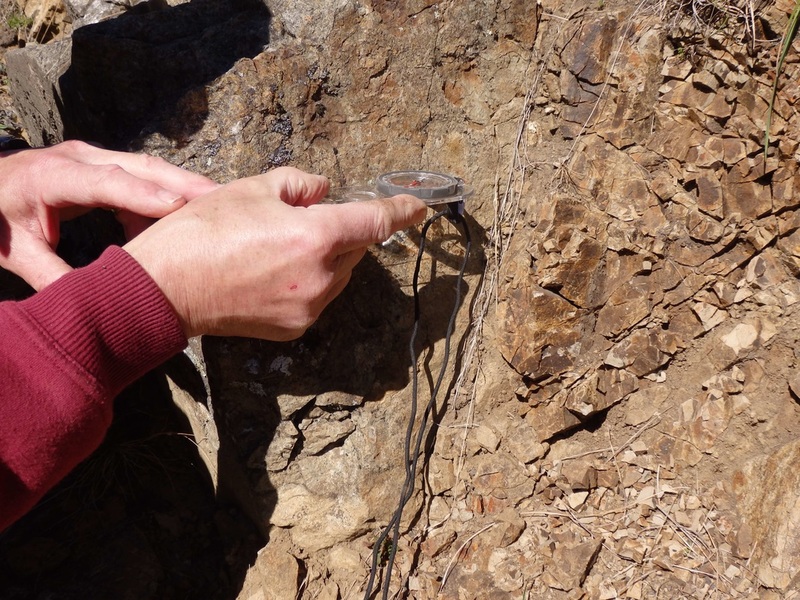 Measurement of dip and strike is vital in attempting to trace and map the rocks. By measuring the dip angle and direction, we can project the lines of the beds across the landscape and work out where it will crop out. ​Left: Dip is measured as the inclination (degrees from horizontal) of the steepest line of dip in the rock. Note the high dip of these beds - typical of most of the rocks at Highfield. Above: Strike is measured as the horizontal compass bearing (azimuth) at right angles to the dip. 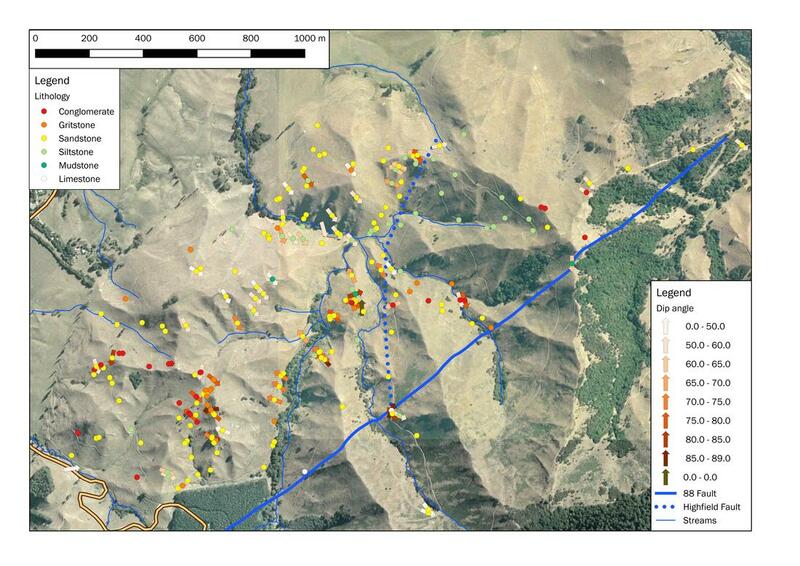 As the map below shows, in the west of the farm the rocks dip south-eastwards at angles of 50-70 degrees. In the central area, the dip is reversed, and the rocks dip more steeply (70-90 degrees) to the west. Few measurements have yet been made in the eastern area of the farm, but those that have suggest another reversal, with dips to the east-south-east. The overall pattern hints at the presence of at least one major fold, in the form of a syncline running south-west to north-east through the area. There is also a suggestion that, on the east side of this fold, the rocks have been overturned (i.e. they have been folded beyond the vertical so that a cross section through the syncline would look like a U shape, leaning slightly to one side). Like much of New Zealand, the Triassic rocks in this area have been affected by faulting. Rarely, this is evident in the form of distinct faultlines, exposed in rock outcrops. More commonly, however, faulting has to be inferred from abrupt changes in geology, the presence of zones of crushed rock (and often impregnated with the low-temperature metamorphic mineral, heulandite), or by knicks in the landscape caused by erosion along the faultline. Above and top right: Two exposures of possible faults in Gully C.
Lower right: A 'pseudo-fault' - probably, in reality, a bed of mudstone that has preferentially weathered to clay (or perhaps a 'gull' opened up by cambering on the valley side). The faults in this area appear to have only a small influence on the landscape. This is probably mainly because they run along bedding planes and thus do not bring together rocks of markedly different character, which erode at different rates. For this reason also, tracing faults across the landscape is not easy. seepage lines and areas of marsh or bog. A number of features such as these can be detected at Highfield, and intriguingly these are located more-or-less as lines across the landscape. They can thus be interpreted to imply two converging faultlines (red, dashed lines), representing the Highfield and Eighty Eight faults, which have been mapped in the wider area. 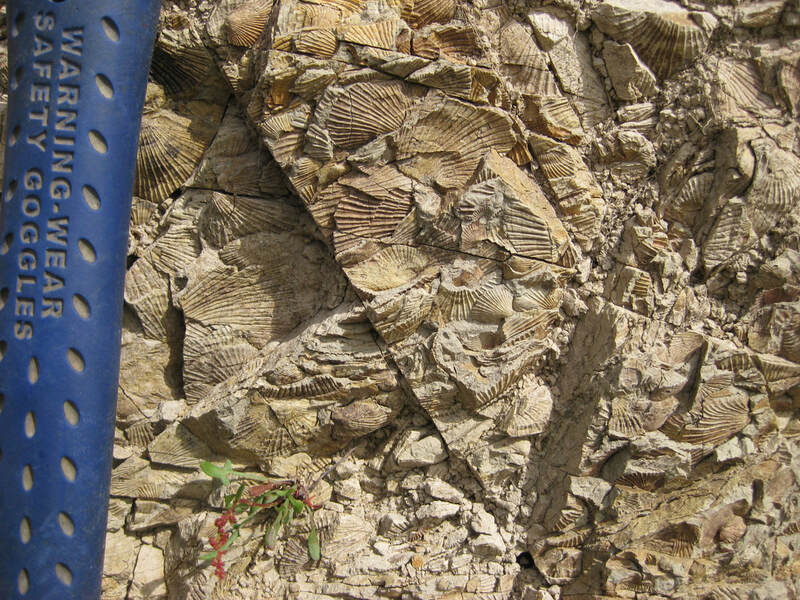 Fossils are widely distributed and locally abundant at Highfield, and comprise a wide variety of biological groups, including brachiopods, bivalves, gastropods, crinoids, bryozoa, anthozoa, ammonoids and plants. Identifying the fossils - especially down to species level - is not always easy. Species are identified not simply on their general shape, but on specific details of their morphology and anatomy (e.g. the shape of internal muscles or appendages) which are not often visible. Individual species also show considerable variation with growth-age and environment (e.g. how exposed the habitat was), while different species have often converged on similar morphologies in response to similar environmental influences. To make matters worst for the palaeontologist, finds are not always well-preserved, and many have been weathered or damaged and deformed by compression in the rocks, so that the details of their features are ambiguous, It is also often difficult to find good, named specimens with which to compare the finds in order to confirm their identification. And to make the process even more challenging, many of the previous studies in this area were done several decades ago, since when many of the species have been reclassified and renamed. Nevertheless, the effort is worthwhile, for fossils provide invaluable information both about the age of the rocks and their depositional environments. By making the distribution of the fossils, and tracing them from one outcrop to another, we can also begin to piece together the stratigraphy of the area. Work is still underway, but recently we have visited the University of Otago to match our finds with specimens held there, and have also had correspondence with several of the professional geologists who have worked on the area in the past (we thank them for their assistance. As a consequence, we have now provisionally identified over 30 species. 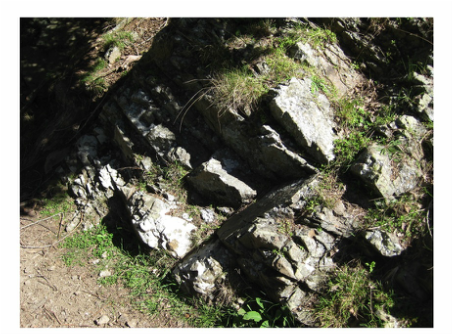 The photographs below show several of the key species that are restricted to specific layers within the geological sequence, and thus help to identify the age of the rocks. Images of other species are shown in the Fossil Gallery. Alipunctifera kaihikuana, a distinctive brachiopod that is restricted to the Kaihikuan stage of the Triassic. It is notable for the small pimples (punctae) that occur on the cast (above) and appear as small perforations the shell when it is present. These show where tubes extended through the shell. The purpose of these tubes has been much debated, but the most convincing explanation is that they were for respiration. Monotis cf richmondiana: a bivalve, this species is distinctive, and marks the Warepan stage. It is often found in rich shell beds, where it is almost the only species present. Several species (or sub-species) have been identified, distinguished in part by the number and shape of the ribs on the shell (most species have larger primary ribs interspersed with smaller secondary or tertiary ribs). 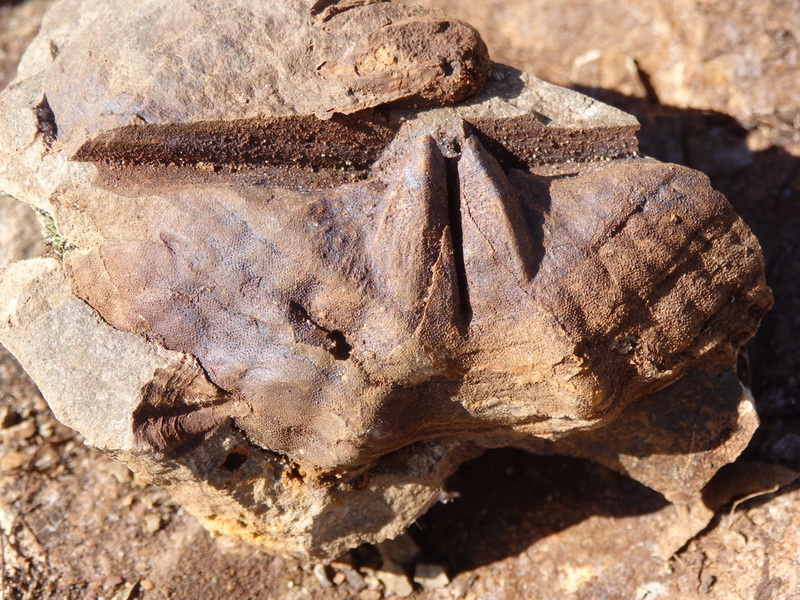 Manticula problematica: a bivalve and one of the most readily identifiable and iconic fossils found on the farm, which helps define rocks of Otamitan age. Most specimens are tear-drop shape, like the one above, though some are rounder in outline.A few, however, are grossly inflated, so that the bottom shell (the more curved one) bulges outward like a balloon. Why this happens is not clear. Our preferred suggestion is that it is a growth response when the animal was living in rapidly accreting environment - a way of keeping itself above the sediment. Eoheteropora maorica. This interesting species was once classified as a bryozoa, but is now attributed to the anthozoa - a class of marine animals that includes sea anemones and soft and stony corals. It is rarely found, and occurs mainly in gritty sediments of Kaihikuan or Otamitan age. The image above is considerably magnified - the original specimen shown here is only a few millimetres across. 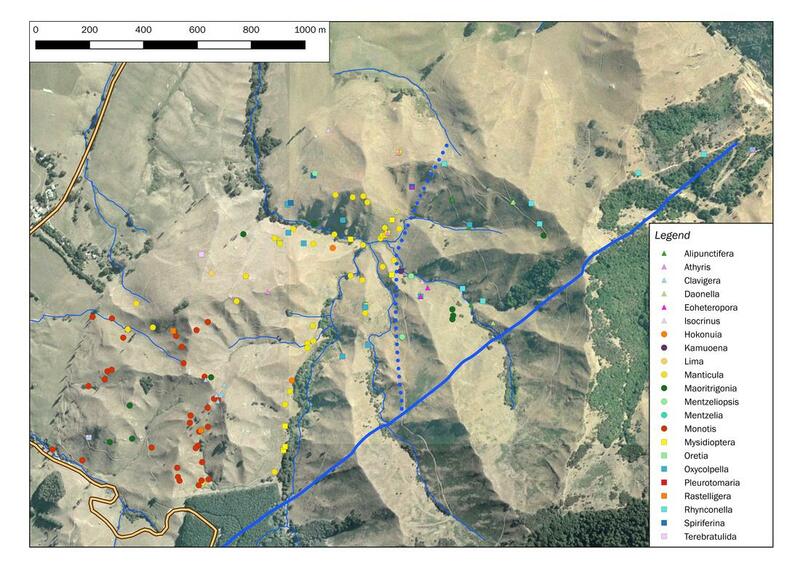 ​The distribution of the named fossils that have so far been recognised (at genera level) is shown in the map below. 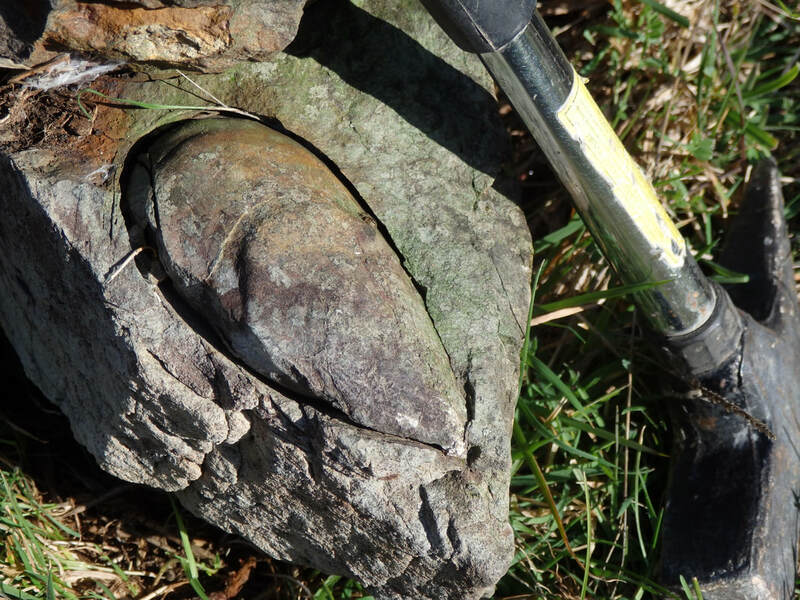 ​Based on all the evidence we have gathered, we can now start to suggest a detailed interpretation of the Triassic geology on Highfield Farm. This is summarised in the map and the cross-sections below. The map overlays the fossil finds with the measurements of dip and the evidence for the inferred faultlines. The results are broadly consistent. 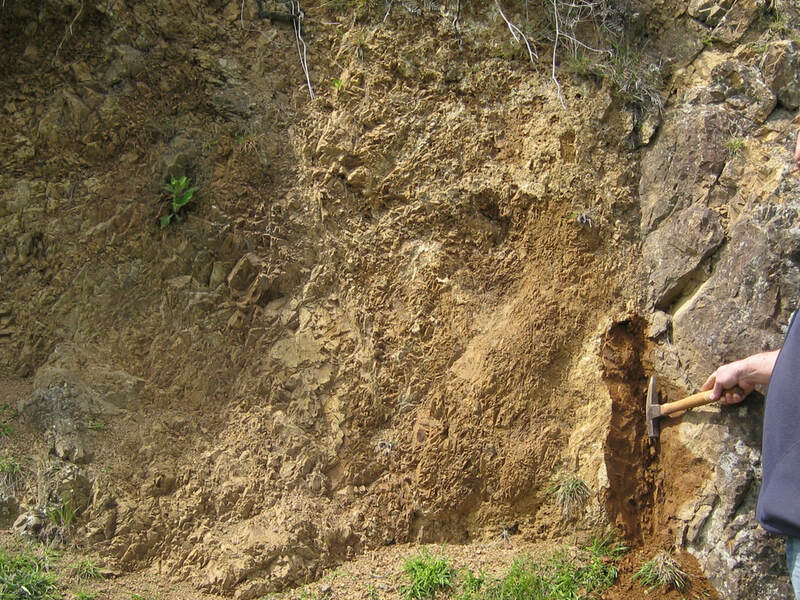 Kaihikuan rocks are limited to the area between the Highfield and Eighty Eight faults. The rocks thus appear to be a fault-bounded block, uplifted during the earth movements that affected the area during the late Tertiary and early Quaternary. The younger Triassic rocks (Oretian, Otamitan, Warepan and Otapirian) are confined to the west of the Highfield Fault and north of the Eighty Eight Fault On the basis if their their dip and distribution, they appear to form a narrow, tightly folded syncline, trending south-west to north-east, and truncated by the Highfield Fault in the east and the Eighty Eight Fault in the south. 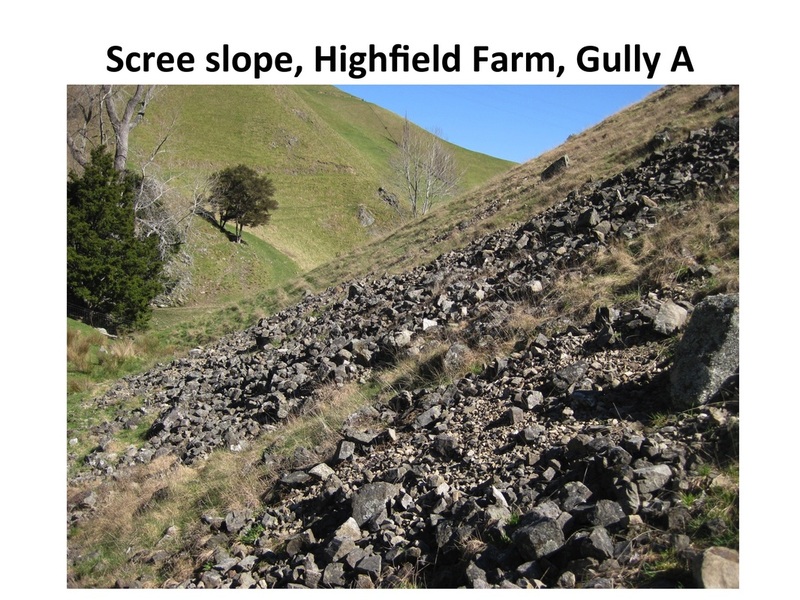 It might be imagined that the folding that created this syncline was associated with westward compression of the rocks by the massive heart movements that created the Richmond Hills and Southern Alps. Boundaries between these stages are approximate and often defined mainly by the distribution of fossils. In several cases, however, boundaries are also indicated by changes in rock type. 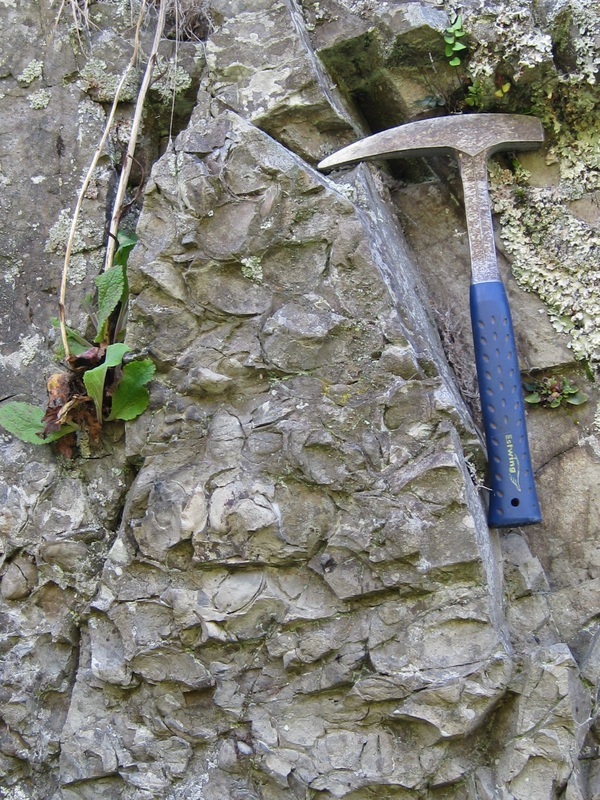 One or more bands of limestone, for example, mark the presence of the older rocks of the Stephens Group (and thus help to define the line of the 88 Fault). A distinct bed of conglomerate separates the Warepan and Otapirian rocks, and distinguishes the shape of the syncline in the south-west of the farm. More patchy beds of conglomerate and gritstone also seem to define the base of the Kaihikuan and Otamitan stages. These beds are significant, for they how where coarse rocks were being swept off nearby land, and thus indicate relatively shallow, coastal waters adjacent to uplifting land masses. They thereby mark tectonic events. It is, to a great extent, this tectonic activity that is responsible for the change in fossils and gives reason to recognise different stages in the rock sequence. The diagram below shows a highly schematic picture of the geological structure and stratigraphy implied by this interpretation. The three transects run from west-north-west to east-suth-east. In thew south, the syncline is evident. To the north, it becomes shallower and the younger (Warepan and Otapirian) rocks have been removed by erosion. 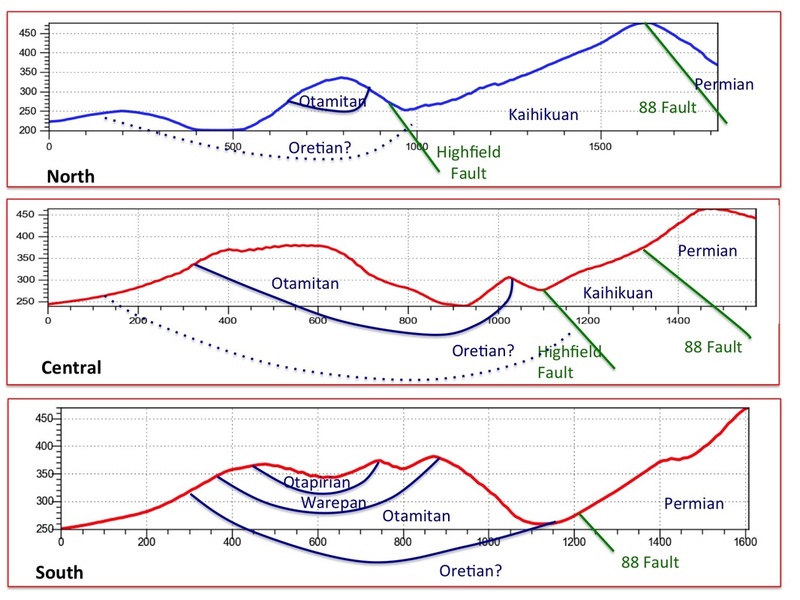 In the east of the study area, the divergence of the Highfield and Eighty Eight faults is associated with uplift of a fault-bounded block of Kaihikuan rocks, truncating the syncline. As with any attempt to map the geology of an area, the interpretations presented here are provisional, and are subject to uncertainties. Some of these uncertainties can be addressed by more fieldwork. There is a need, for example, to carry out more measurements of dip and strike, especially within the area of the Kaihikuan rocks. More fossil collection is likewise needed in the less intensively studied areas in the south-west and north of the area, where mapping remains tentative. More detailed mapping is also required to confirm the outcrop of Oretian rocks, which at present are somewhat speculative. The projected line of the main faults similarly needs to be confirmed by further fieldwork, while the possible presence of other, more minor cross faults (and perhaps gulls) needs to be explored in various localities. In addition, much effort is going into the laboratory effort of classifying the fossil finds. Anyone interested in contribution to this work is invited to get in contact with the authors, via the Club secretary (see Contact page).